Record numbers of bright eyed people shuffled through the doors of the Dallas Makerspace for the very first of our Open House events, held on November 20th. Brought by common interest, curiosity, profession, and a desire to connect with other like minded individuals, nearly two hundred people came out to witness laser cutters, robots, makerbots and a myriad of other attractions happening throughout the day. A heartfelt thank you goes out to everyone who put time into making this event a huge success. Several of the DMS members committed their whole day to introduce newcomers to the space, show them around and answer all their questions about our purpose and what comes with membership. Many other members spent hours doing demos and presentations. 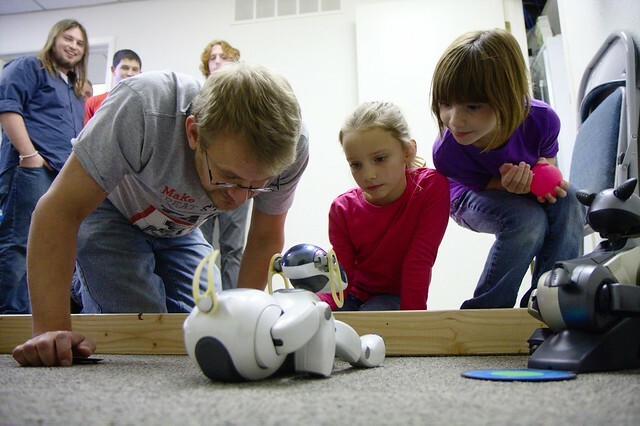 Others still brought out their robots encouraging people of all ages to “get behind the wheel” of their creations. 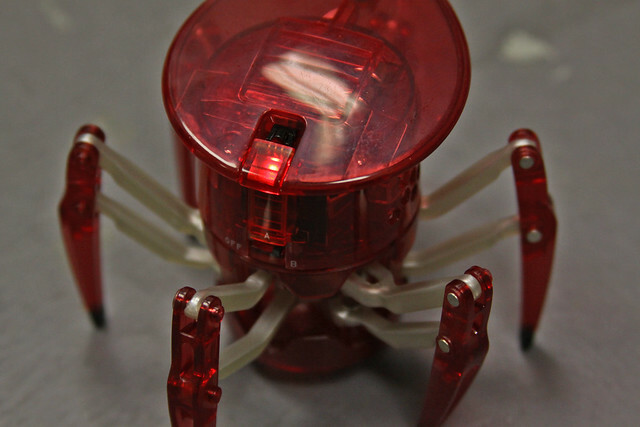 Greg Needel brought out several of the new Hexbugs, delighting adults and children alike with their easy-to-use controls. When darkness fell, Mike Albright brought out his laser and with the help of a fog machine created a laser tunnel. During the early hours of the Open House, the DMS received a visit from an electric car owner, who hung out in the parking lot explaining the inner workings and concepts behind what makes a car run on circuits and electrical currrents.Cali Lewis from GeekBeat.TV came out in the evening and interviewed several members about their presentations. In the near future the podcast will be available on their site as well as iTunes. To view other videos and photographs from the event check out the DMS Wiki and the DMS flickr group. You might be interested to know that Hexbugs’ design has been “borrowed” from another inventor, Jamie Mantzel.